Type I Diabetes - The pancreas is responsible for controlling the amount of glucose in the blood. In Type I diabetes the pancreas doesn’t produce enough insulin. Type II Diabetes - In this type of diabetes the body cells do not react to insulin. The high blood sugar levels caused by diabetes can damage the retina. 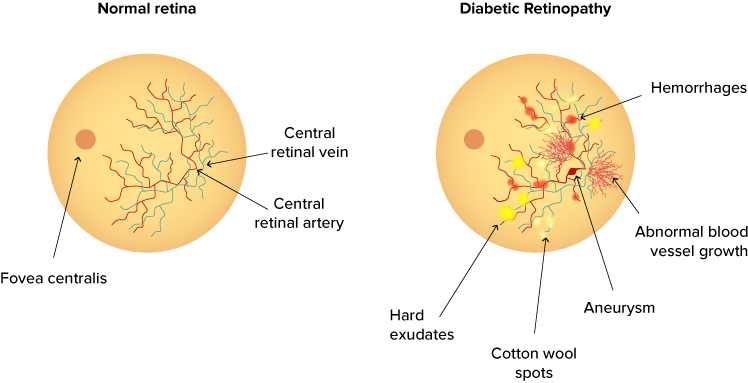 There are four main stages of diabetic retinopathy that your optometrist can examine you for. Pre-proliferative retinopathy - At this stage the bleeding from the blood vessels becomes more severe, and the amount of oxygen in the eye reduces. There may also be leakage of fluid, which may affect your vision. In the first two stages, which include the background and pre-proliferative, treatment may not be required. If the diabetic retinopathy progresses further, laser surgery or surgery on the vitreous may be required. Diabetics are recommended to have an eye test at least once a year, and are also entitled to free annual eye tests on the NHS.